A pterygium (from the Greek pterygion meaning wing) is a raised, triangular or wedge-shaped overgrowth of conjunctival tissue over the surface of the cornea (the transparent dome at the front of the eye). It usually occurs on the nasal side of the cornea and is often bilateral. In the early stages only small grey opacities at the junction of the cornea and the white of the eye can be seen. The conjunctiva can then overgrow these opacities and encroach on to the cornea in a triangular fashion. There is often a family history so genetic factors, perhaps due to the shape of the front of the eye, may play a role. Other possible risk factors include immunological mechanisms, chronic ocular irritants, tear film anomalies and the human papilloma and Epstein-Barr viruses. Are there any way to prevent the formation of Pterygia? Measures to prevent formation of pterygia are based on the protection of the ocular surface from excessive chronic ultraviolet light exposure, by the use of tinted, wrap-around sunglasses and peaked caps or wide-brimmed hats. These measures are especially important in populations residing within 40 degrees latitude of the equator, those with outdoor occupations, surfers, sailors and those residing in desert locations. Vision is only affected in a minority of cases when the pterygium is very extensive and grows towards the centre of the cornea, although it may induce changes in astigmatism at an earlier stage. Treatment depends on symptoms. If the pterygium is small it can be safely left, especially in individuals residing in temperate climates. Patients should be advised to protect their eyes from ultraviolet light with good quality wrap-around sunglasses and hats with peaked brims. If the patient has symptoms of ocular irritation, burning or itch these may be alleviated with artificial tear drop preparations. 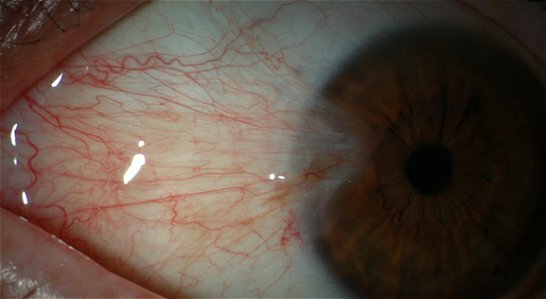 If these symptoms are associated with inflammation of the pterygium, mild steroid eye drops may be prescribed but only under ophthalmological supervision. Reduced visual acuity from induced astigmatism or encroachment of the pterygium to/over the visual axis. Double vision secondary to restriction/tethering of the medial rectus muscle. Prior to surgery it must be ensured that the lesion is a true pterygium and not a mimicking condition. Individuals undergoing such surgery require careful pre-operative counselling as, whilst pterygium surgery is generally successful, symptoms of ocular irritation and burning may not be entirely relieved and persistent redness and deep corneal scarring beneath the pterygium may mean that improvement in ocular cosmesis is only partial. Furthermore, the patient needs to be advised that recurrences after surgical removal are not infrequent and may be aggressive. There are a variety of surgical approaches, underlining the point that no method is entirely successful. Simple excision, whilst simple and quick to perform, is associated with high recurrence rates of over one third. Therefore this is usually combined with conjunctival auto-grafting, which involves covering the bare area created following pterygium removal with a free conjunctival graft taken from the superior conjunctiva. As well as covering the bare area, it is thought that the graft acts as a barrier to recurrence. Published recurrence rates after conjunctival auto-grafting techniques are encouraging and range between 5% and 15%, making it the most favoured technique. The use of fibrin sealant/glues instead of sutures has been shown not only to reduce operative time but also improve post-operative patient comfort. Some surgeons also advocate the use of other topical therapies, such as Mitomycin-C (a chemical used in cancer treatment) and Beta-Radiation to reduce recurrence. However, whilst such adjunctive agents may reduce rates of recurrence following simple excision, their use can be associated with significant sight-threatening complications, such as ulceration of the eye wall and even perforation. Typically the eye feels sore following surgery for a few days and irritable for several weeks. Eye drops in the form of antibiotic/steroid combinations are administered for several weeks/months. Redness of the eye usually settles after a few months. Recurrence (re-growth) can occur weeks/months after the surgery and occurs in about 5% to 15% of eyes. Patients can usually resume normal activities 1 to 2 weeks after surgery. Rare complications include infection and reduced vision. It is important for patients to take the prescribed eye drops and take protective measures to avoid excessive ultra-violet light exposure (as described above).